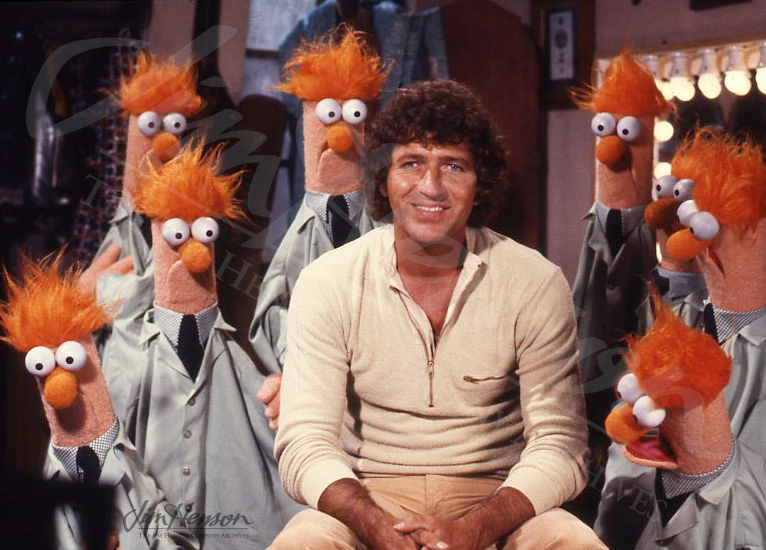 As introduced by Kermit, “recording star, composer and singer” (and songwriter for none other than Elvis Presley) Mac Davis had a memorable experience when he guest starred on The Muppet Show. Not only was it the Texan’s first trip to Europe, but he was also treated to multiple encounters with the hapless Beaker during the show. Along the way, he sang his hit song “Baby, Don’t Get Hooked on Me” in an underwater setting. Miss Piggy joined him costumed as a comely mermaid. 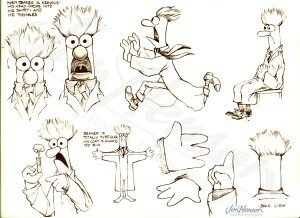 Another pig, the self-effacing Link Hogthrob, joined him for “Hard to Be Humble.” As it turns out, Beaker was a favorite; Davis noted, “I’m partial to Beaker, because he’s such a fall guy.” The writers took note and wrote a particularly ridiculous backstage story featuring the bumbling lab assistant. Dr. Bunsen Honeydew revealed his new copying machine and said he was, “eager to test it.” Beaker, naturally, got caught up in it and soon the theater was littered with duplicate Beakers, to the horror of Bunsen but the delight of Beaker’s fans. His doppelgangers invaded Fozzie’s “Bear on Patrol” bit, interrupted the Swedish Chef (about whom Davis remarked, “He’s a genius!”), and joined the Electric Mayhem during Davis’s final production number, “I Believe in Music.” Even Statler and Waldorf were joined in their box by a bevy of Beakers. Mac Davis and a few Beakers on The Muppet Show, 1980. 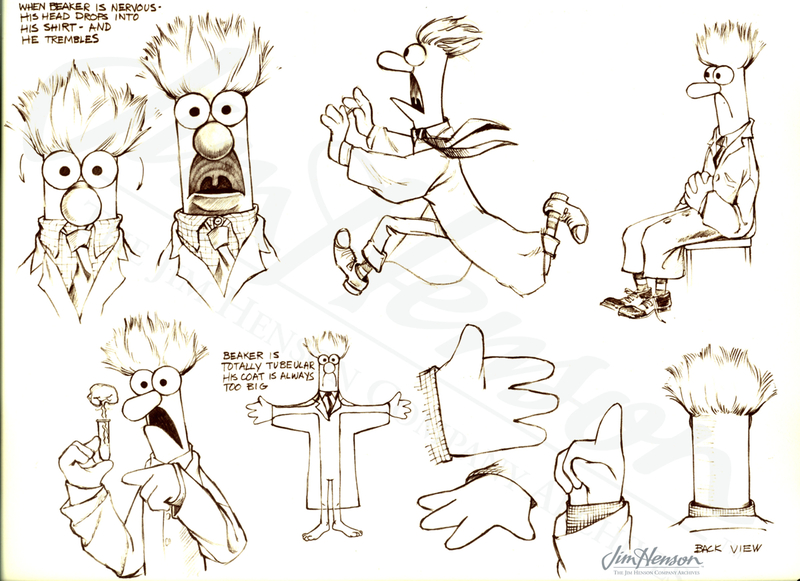 The many faces of Beaker in The Muppet Show style guide, 1979. Puppet builder Amy van Gilder’s idea for handling Beaker’s hair. 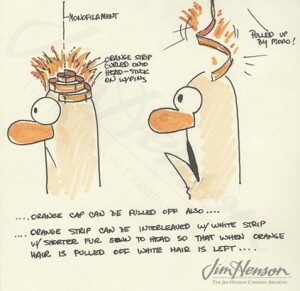 This entry was posted in 06-June '80, 1980, Muppet Show and tagged Beaker, Dr. Bunsen Honeydew, Electric Mayhem, Elvis Presley, Kermit, Link Hogthrob, Mac Davis, Miss Piggy, Statler and Waldorf, Swedish Chef. Bookmark the permalink.